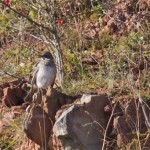 An Eurasian Wryneck (Jynx torquilla) sitting open on a stone singing in the morning light is a really rare sighting. The obtrusive väh-wäh-wäh – calls can be heard from afar. The emitting bird remains hidden. 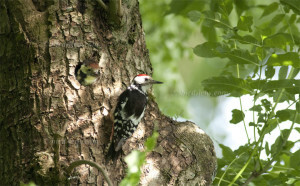 In the second half of April, the powerful courtship calls of a bird, which is rarely seen, are often heard. 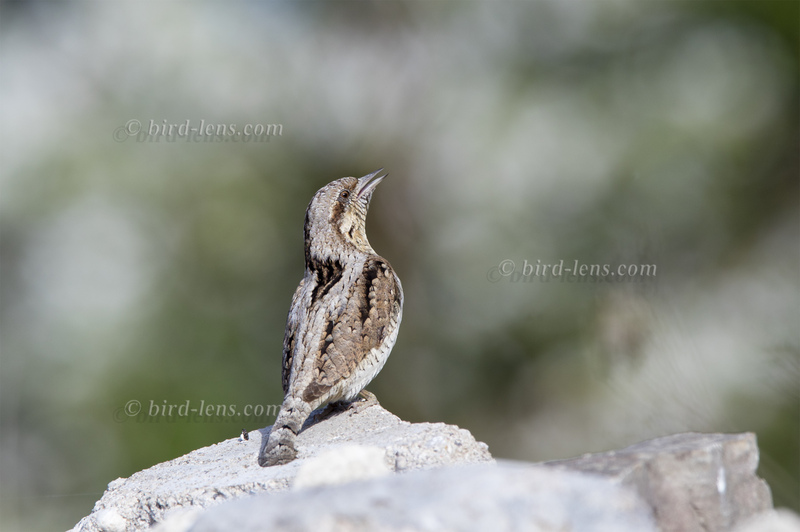 The Eurasian Wryneck is to be heard. Its voice is unmistakable. The Eurasian Wryneck prefers open landscape forms as a habitat. So its breeding ground in Europe can be found in orchards, parks and open, light forests. The Eurasian Wryneck spends the wintering season in Africa. 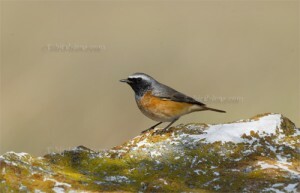 At the end of March / beginning of April it returns to its breeding area. 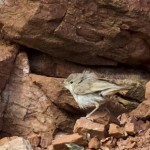 The Eurasian Wryneck quickly discovers a new breeding cave. The Eurasian Wryneck is grey-brown above, finely striped like a bark, below creamy yellow and has at the throat a grey-brown banded plumage. The Wryneck almost looks like a long-drawn sparrow. 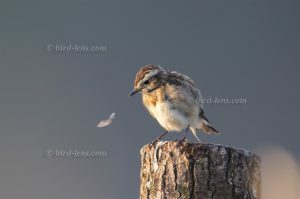 But the Wryneck can turn its head 90 degrees. This ability helped him to his name. Due to its camouflage color, it is particularly difficult to find it. But if it is in court in the spring, he mutates to the real screamer. Then the nasal calls of both sexes are hard to miss. 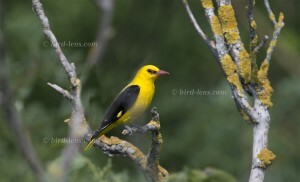 During this time, the best options are to photograph different behaviors of this bird. 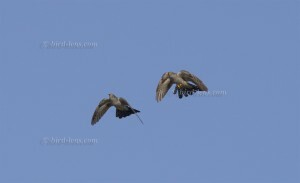 During a trip from October 08th till 13th 2012 to experience migrating birds on Helgoland several remarkable sighting could be noted. 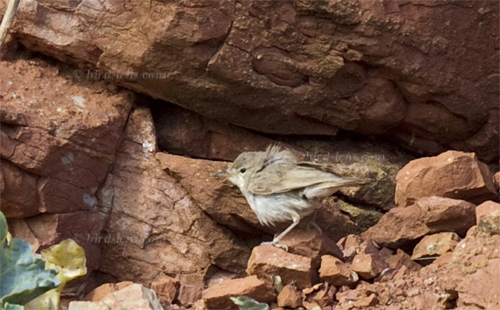 A Booted Warbler, Hippolais caligata, was seen at the red sandstone cliff at the southern corner of Helgoland, at the so-called “Kringel” on the 9th of October 2012. On the same day a Siberian Stonechat, Saxicola maura, was seen in the area near the sports field and a Rosy Starling, Pastor (Sturnus) roseus, was seen in the Kurpark. Further remarkable sightings on that day was a Barred Warbler, Turtle Dove, a Wryneck and the Yellow-browed Warbler. Although the Booted Warbler thrilled the many birdwatchers already, that feeling could be even increased. On the following day, a strange thrush could be observed. Short ID-discussion revealed a Turdus atrogularis, a Black-throated Thrush, a recent split from the Dark-throated Thrush, Turdus ruficollis. The bird showed only for a few moments and disappeared for more than 2 hours. In the evening – just before dusk – it was seen briefly again. The lucky few were happy but the many frustrated birders who did not see it expected that the birds will leave in the night. This due to the fact, that a calm night with low wind was forecasted. 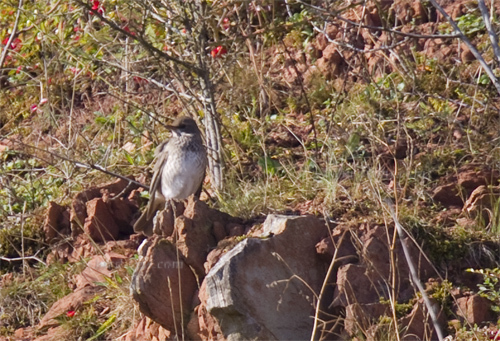 It was a happy surprise, that on the following days until – at least – the 15th of October the the thrush showed up again – albeit with long times in between suddenly appearing on the steep slope just below a place called Falm on the so-called Oberland.